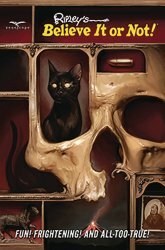 An anthology of some of the most phantasmagorical oddities in the Robert Ripley collection, written and illustrated by an equally mind-blowing mix of comic book legends and rising stars. You'll have to see it to believe it! "A Tale As Old As..."
"The Ride of His Life"
Brand-new soft-cover book. 120 full-color pages. This volume reprints Ripley's Believe It or Not issue 1 & 2 by Zenoscope Entertainment. January 2019.